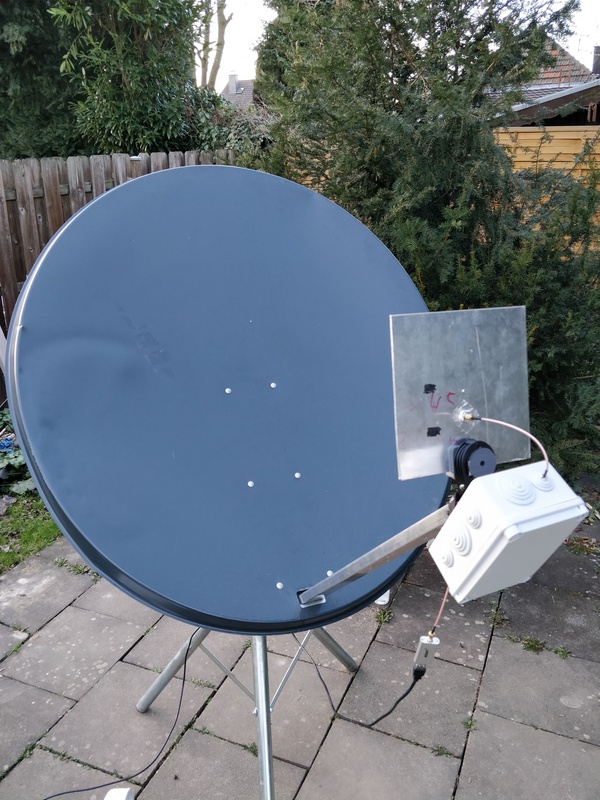 My QTH is located near Cologne, North Rhine-Westphalia in Germany and consists of two fixed Antennas on the Roof of the house as well as a moveable Satellite Dish in the garden. Thw two fixed antennas are now up there since october 2017 and they are still fine even after the strong storms (up to 120km/h gusts) we had in the past months. I build both antennas myself and i also made a how to video about them over on Youtube. The bigger one of them is a QFH Antenna that is build for the 2m Band. It's mostly made out of PVC pipe and some 3D printed parts out of PETG. The helical is made out of 2.5mm² solid copper wire that i got at the nearest hardware store. I mostly use the Antenna to receive HAM Radio Satellites, the International Space Station short ISS as well as APT and LRPT Signals from Weather Satellites. The ANtenna also still works decent on UHF to receive Satellite Pirates or other Signals in that Band. I use a 5m long CFD200 cable for the connection to it. I either use my RTL_SDR or Airspy Mini mostly directly on the Antenna. But sometimes i add some Filters to them as well. Unfortunately i have a lot of interference around, so any broadband LNA like the LNA4ALL is not working well. The little one on the boom is a Spider / Ground Plane Antenna that is tuned for a frequency of 1090mhz where ADS-B Signals are transmitted. It's made out of only a SMA flange and some pieces of 2.5mm² solid copper wire. I also use a 5m long CFD200 cable for the connection to it. This Antenna is a inherent part of my flight radar a run. Because of that it and a UpUtronics filtered LNA is connected to a RTL-SDR v3 all the time. I also use a Raspberry Pi 3 that processes the Signals and then send's the data to the Servers of Flightaware, Flightradar24, Planefinder und ADSB Exchange. I can also look at the received Data in my LAN on the PiAware Webinterface. For a while now i work on getting high resolution images over HRPT from weather satellites. They transmit in the L-Band at around 1700mhz. Because of that i have a 1.2m big Satellite Dish standing in my garden that is mounted on a camping stand that i use for receiving. I mounted my selfmade Feed on the standard 40mm LNB Mount that is connected to a box that contains two SPF5189 LNAs as well as a Filter. I don't have a automatic rotor yet, so i track all satellites by moving the Dish by hand, what works quite well after some practice. Because the Dish is not standing that stable, i only mount the Feed and LNA/Filter Box to it when i want to receive something. It also fell over a few times now, so it has a lot of dents in it what is far away from perfect for the signal strenght. As a radio i use a Baofeng UV5R at the Moment that is connected over a micro diplexer to the two parts of the Antenna.